The Daring Bakers’ April 2012 challenge, hosted by Jason at Daily Candor, were two Armenian standards: nazook and nutmeg cake. 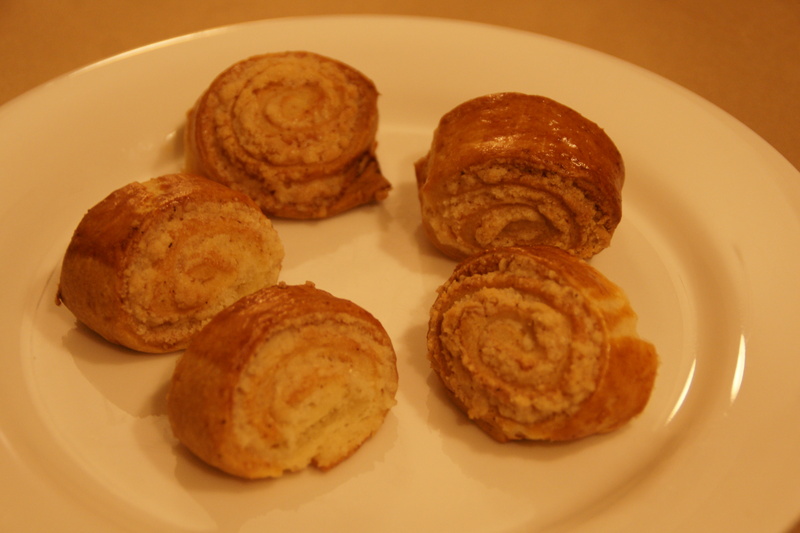 Nazook is a layered yeasted dough pastry with a sweet filling, and nutmeg cake is a fragrant, nutty coffee-style cake. Bakers were invited to make either or both items. Miss B – I love that cake! Me – Really? How do you know, I’ve never made it before. Miss B – I had it when I was a baby and I’ve loved it ever since then. Anyway, here is how the challenge played out in my house. Sadly, I forgot to turn the camera off after taking photos of my bread for the last post, so had to take photos with the husband’s iphone. So the photos are even more dodgy than usual, sorry. 1. Place the sifted flour into a large bowl. 2. Add the dry yeast, and mix it in. 3. Add the sour cream, and the softened butter. 4. Use your hands, or a standing mixer with a paddle attachment, to work it into a dough. 5. If using a standing mixer, switch to a dough hook. If making manually, continue to knead for about 10 minutes, or until the dough no longer sticks to the bowl or your hands. 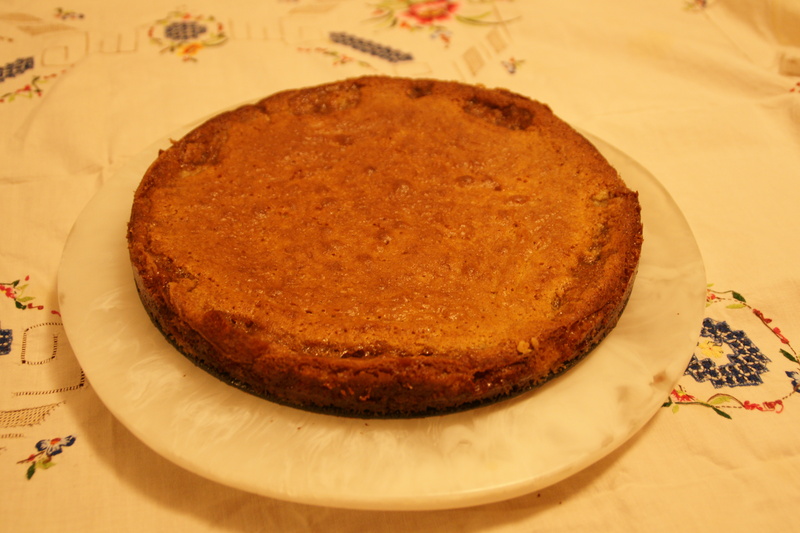 If it remains very sticky, add some flour, a little at a time. 6. Cover the dough and refrigerate for 3-5 hours, or overnight if you like. 7. Mix the flour, sugar, and the softened butter in a medium bowl. 8. Add the vanilla extract. 9. Mix the filling until it looks like clumpy, damp sand. It should not take long. Set aside. 10. Preheat the oven to moderate 350°F/175°C/gas mark 4. 11. Cut the refrigerated dough into quarters. 12. Form one of the quarters into a ball. Dust your working surface with a little flour. 14. 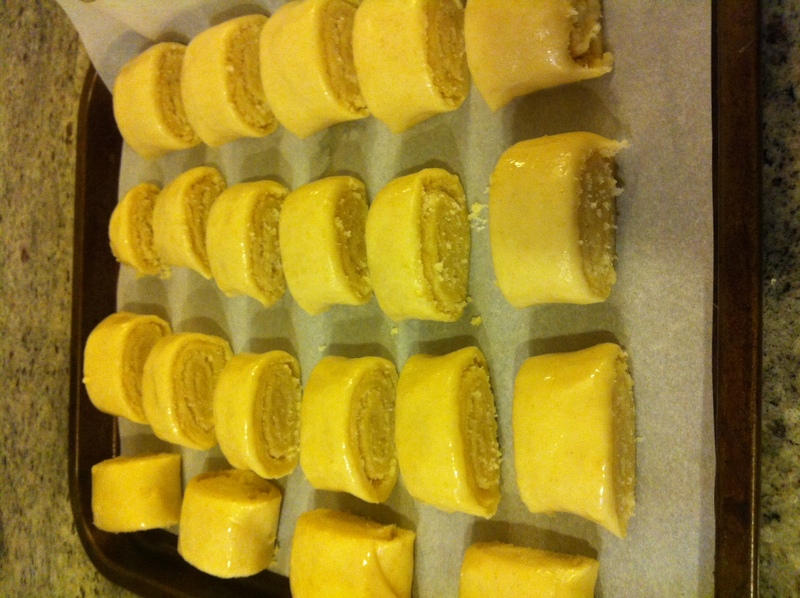 Spread 1/4 of the filling mixture across the rolled-out dough in an even layer. Try to spread the filling as close as possible to the edges on the short sides, but keep some of pastry dough uncovered (1 inch/2.5 cm) along the long edges. 15. 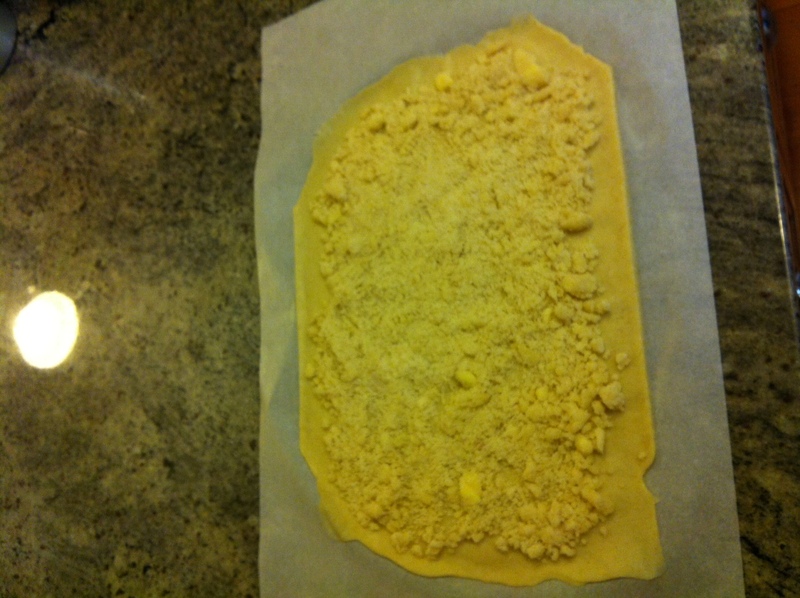 From one of the long sides, start slowly rolling the dough across. Be careful to make sure the filling stays evenly distributed. Roll all the way across until you have a long, thin loaf. 16. Pat down the loaf with your palm and fingers so that it flattens out a bit (just a bit). 17. Apply your egg yolk wash with a pastry brush. 18. Use your crinkle cutter (or knife in my case) to cut the loaf into 10 equally-sized pieces. Put onto an ungreased cookie sheet. 19. Place in a preheated moderate oven for about 30 minutes, until the tops are a rich, golden brown. Jason offered two different ways to make this cake – the traditional way (basically by hand) or the quick way (in my case, by Thermomix). I chose the quick way. 12. Cool the cake in the pan. I didn’t really pay attention to the direction about the right size of cake tin to use so it ended up being too big and therefore too flat. 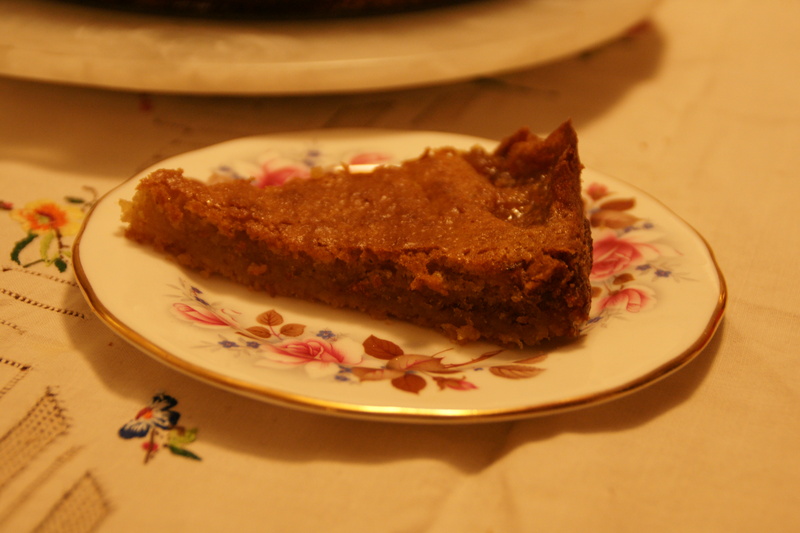 The upside of that was that it had a nice chewy edge to it, which was appreciated by the husband. And hopefully by my neighbours, since they scored half the cake! Thanks Jason and Jason’s Aunt Aida (who starred in very helpful instructional videos) for a fun challenge. In other news, it was our wedding anniversary yesterday and to celebrate we went out for completely mind-blowing cocktails at The Roosevelt in Potts Point. Seriously amazing. The low-level headache it has left me with today was worth it. Haha, I love children. I used to babysit a boy (4) who swore that when he was 18 he had a motorcycle. Not will have, but already had. Um…ok! 🙂 Beautiful job on the challenge this month! Both the nazook and the nutmeg cake look great!